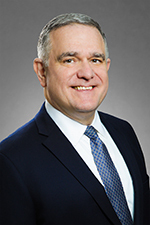 Edward K. Lenci focuses on the litigation and arbitration of complex business/commercial disputes, including those involving reinsurance and business process services, and the defense of businesses sued in class action lawsuits. He has considerable appellate experience, too, including a class action defense victory in the U.S. Supreme Court involving a class action waiver in a student loan's arbitration clause. Drawing on his extensive experience with domestic and international arbitration, Mr. Lenci has drafted arbitration clauses tailored to the unique needs of a variety of clients. He chairs Hinshaw's reinsurance practice as well. He has spoken around the world and written about a variety of topics relating to arbitration of disputes and reinsurance, and the media has quoted him concerning arbitration of disputes, Brexit, foreign sovereign immunity, and the Consumer Financial Protection Bureau. Prior to joining Hinshaw, Mr. Lenci was a founding partner of Wilker & Lenci, LLP, a well-regarded New York City boutique firm which focused on business litigations and arbitrations, particularly international arbitrations and reinsurance disputes. Before that, he was a partner in the New York City office of a large international firm and had earlier worked at New York City's Marks & Murase. He began his legal career while in law school when he interned in 1988 at Hamada & Matsumoto (now Mori, Hamada & Matsumoto) in Tokyo, where he worked closely with The Honorable Kunio Hamada, later a Justice of the Supreme Court of Japan. Received "Recognition of Achievement with Honors" in the study of international and foreign law from the Parker School of Foreign and Comparative Law of Columbia University School of Law. An order of the U.S. Supreme Court, vacating and remanding a decision of a federal Court of Appeals, which had held that a class action waiver in the promissory note's arbitration clause was unenforceable. A decision permitting the loan servicer, under the doctrine of estoppel, to invoke a class action waiver in a loan's arbitration clause even though the servicer was not itself a party to the promissory note. Decisions transferring venue of purported class actions against the loan servicer. Decisions denying class certification and interlocutory appeal under Rule 23(f). He is the lead attorney defending a producer of all-natural honey in a federal class action lawsuit arising from the producer's use of the word "natural" on its labels. He was the lead attorney in a federal trial in which he successfully defended one of the world's largest providers of business process services against contractual claims asserted by a colocation facility, winning a trial verdict dismissing all claims. He successfully pursued multimillion dollar claims under CERCLA and an indemnity agreement on behalf of a Chilean conglomerate and its U.S. subsidiary after five industrial sites they acquired from a Fortune 100 company in the 1990s became the subject of environmental actions and investigations by federal and state authorities. In the bankruptcy case of Pali Capital, a once prominent investment bank, he secured an order that stayed the New York adversary proceeding in favor of arbitration in Los Angeles. Affiliated Computer Services, Inc. v. Fensterstock, 564 U.S. 1001 (S.Ct. 2011) (Supreme Court vacated and remanded a decision of a federal Court of Appeals) (described above) (this victory was a front-page story in The New York Law Journal on June 14, 2011). AiNET Corp. v. Xerox State & Local Sols., Inc., 739 Fed. App'x. 68, 2018 U.S. App. LEXIS 28611 (2d Cir. Oct. 18, 2018) (denying plaintiff's appeal of the district court's decision that the defendant properly terminated its subcontract with plaintiff and cancelled a work order). Breitman v. Xerox Educ. Servs., 2d Cir. Docket No. 15-185 (2d Cir. Mar. 24, 2015) (denying plaintiff's appeal under Rule 23(f), Fed. R. Civ. Pr., from the lower court's decision not to certify the purported class). Amerisure Mutual Insurance Company, et al. v. GLOBAL Reinsurance Corporation of America, 927 N.E.2d 740 (Ill. App. 2010) (won vacatur of an arbitral award by proving that the arbitrators exceeded their authority and committed a "gross error of law") (this victory was the lead story in the Chicago Daily Law Journal on March 16, 2010). Intertec Contracting, A/S, et al. v. Turner Steiner International S.A., et al., 774 N.Y.S.2d 14 (N.Y. App. 2004) (won reversal of the trial court's decision that had dismissed a transnational construction claim on the grounds of forum non conveniens) (this victory was the "Decision of the Day" in The New York Law Journal on March 22, 2004). Mutual Marine Offices, Inc., et al. v. Banco de Seguros del Estado, 344 F.3d 255 (2d Cir. 2003) (convinced a federal Court of Appeals that an insurer owned by the government of Uruguay had waived sovereign immunity). Gerling Global Reinsurance Corporation – U.S. Branch v. ACE Property & Casualty Insurance Co., 42 Fed. Appx. 522, 2002 WL 1770725, 2002 U.S. App. Lexis 15571 (2d Cir. 2002) (demonstrated to a federal Court of Appeals that a reinsurer was not required to arbitrate its rescission claim because the arbitration agreement did not encompass such a claim). Intertec Contracting, A/S, et al. v. Turner Steiner East Asia Ltd., et al., 6 Fed. Appx. 61, 2001 WL 266997, 2001 U.S. App. Lexis 4156 (2d Cir. 2001) (showed a federal Court of Appeals that an arbitration clause in a construction contract requiring arbitration in Sri Lanka was not incorporated by reference into a subcontract). Curiale v. AIG Multi-Line Syndicate, Inc., et al., 640 N.Y.S.2d 18 (N.Y. App. 1996) (convinced a New York state appellate court that a reinsurer was entitled to rescission). Mr. Lenci chairs Hinshaw's reinsurance practice, and his experience in the area of reinsurance dispute resolution is extensive and highly regarded. He "scored a hat trick" by winning the rare remedy of rescission of a reinsurance contract on three separate occasions — once in a jury trial, once in an arbitration, and once from the bench — and has also successfully defended against claims of rescission. He has also collected many millions of dollars from reinsurers located in Latin America, Asia and Europe. Skandia America Reinsurance Corp. v. Caja Nacional de Ahorro y Seguro, 1997 WL 278054 (S.D.N.Y. 1997) (in a federal proceeding to confirm an arbitral award, persuaded the court that a reinsurer owned by the government of Argentina was not immune from posting pre-answer security because the New York Convention, which permits such security, trumped the U.S. Foreign Sovereign Immunities Act). National Union Fire Insurance Company of Pittsburgh, Pa v. Clearwater Insurance Company, 2007 WL 2106098, S.D.N.Y. July 21, 2007 (No. 04-CV-5032) (demonstrated to a federal court that the doctrine of "follow the fortunes" did not require the reinsurer to cover ECO). Gerling Global Reinsurance Corporation — U.S. Branch v. ACE Property & Casualty Company (S.D.N.Y. 2003) (won the first jury verdict in the United States rescinding a reinsurance agreement). Liquidation of The Home Insurance Company (demonstrated to a New Hampshire tribunal that The Home was not the reinsurer of the firm's client, a foreign insurer, thus paving the way for collection of payment in full from its true reinsurer). GLOBAL Reinsurance Corporation – U.S. Branch v. Sompo Japan Insurance, Inc., 2005 U.S. Dist. LEXIS 37969 (S.D.N.Y. 2005) (showed an arbitration panel, and then a federal district court, that a Japanese reinsurer must post a $7.5 million LOC in favor of its cedent based soley on the latter's annual statement). Mr. Lenci is Co-chair of ARIAS-U.S.'s International Committee, was organizer and Co-Chair of the HarrisMartin Reinsurance Summit in September 2011, is a Charter Member of the Editorial Board of Reinsurance and Arbitration, a publication of HarrisMartin, and served from 2010-2017 as Co-Chair of the Insurance and Reinsurance Committee of the New York State Bar Association's International Section. Oona Tropeano Expressions, Inc. v. Studio Chevalier, Ltd., et al., 04 CV 8887 (S.D.N.Y. 2007). Mr. Lenci won dismissal of a copyright infringement claim that a U.S. designer brought against a Canadian custom printing company. He followed up this victory by recouping most of the attorneys' fees his client expended. Dr. Ernest Rossi, et al. v. Irvington Publishers, 04 CV 7191 (S.D.N.Y.). Mr. Lenci represented Dr. Ernest Rossi, the collaborator of the late Dr. Milton H. Erickson, a pioneer in the field of medical hypnotherapy. As a result of Mr. Lenci's efforts, Dr. Erickson's classic works are once again available to the field. The Health Consultants Group v. Dailey, 2004 U.S. Dist. Lexis 23718 (S.D.N.Y. 2004). Mr. Lenci tried a case in federal court resulting in the issuance of an injunction against a former employee of a Connecticut-based health insurance broker, enforcing the terms of a restrictive covenant. Mr. Lenci's skillful cross-examination of the former employee resulted in the trial judge's observations that the testimony was "contradictory," "evasive," and "confused, tortured and generally less than credible." Successfully defended a well-known financial-services entrepreneur in a federal lawsuit brought by his former employer, a large financial institution, which sought to enjoin the use of its alleged trade secrets and intellectual property and enforce a restrictive covenant. "A Funny Thing Happened on the Way to the Arbitral Forum: The Latest on the Use of Class Action Waivers in Arbitration Clauses in the US," Dublin International Arbitration Day, Dublin, Ireland, November 2017. "The Latest on Class Action/Arbitration Waivers and Class Arbitration in the US," New York State Bar Association International Section meeting, Antigua, Guatemala, September 2017. "Dispute Resolution Involving U.S./Latin America Reinsurance Relationships," ARIAS-U.S. Spring Conference, Naples, Fl., May 2017. Co-Chair, New York State Bar Association International Section European meeting, Dublin, Ireland, April 2017. "Arbitration in Banking, Financial Services and Reinsurance: Current Practice and Future Potential," Dublin International Arbitration Day, Dublin, Ireland, November 2016. "Hot Topics in International Commercial Arbitration," New York State Bar Association International Section meeting, Paris, France, October 2016. "Reinsurance Dispute Resolution in Different Nations and Across National Boundaries: France, the UK, Bermuda, Latin America and the U.S.A.," New York State Bar Association International Section meeting, Paris, France, October 2016. "Drafting Effective Dispute Resolution Clauses," Intermediaries and Reinsurance Underwriters Association (IRUA) meeting, New York, New York, October 2016. "Hot Topics in Transnational Insurance and Reinsurance," New York State Bar Association International Section meeting, São Paulo, Brazil, October 2015. "Allocation and Follow-the-Fortunes/Follow-the-Settlements — Is the Industry Any Clearer Today on Post-Settlement Allocations?" American Conference Institute's National Forum on Reinsurance Regulation, New York, New York, July 2014. "Panel Authority and Panelist Impartiality," American Conference Institute's Advanced Forum on Reinsurance Disputes in Litigation and Arbitration, New York, New York, April 2012. Co-Chair, HarrisMartin Reinsurance Summit, Philadelphia, PA, September 2011. "Judicial Scrutiny of Arbitral Awards in the U.S." New York State Bar Association International Section meeting, Sydney, Australia, October 2010. "The 'American Rule' at Risk: Reliastar Life Insurance Company of New York v. EMC National Life Co.," Hinshaw's 2009 Insurance Services Symposium, Chicago, Illinois, October 2009. "Q&A With Hinshaw's Edward Lenci," Law 360 International Arbitration, May 16, 2016. "Sovereign Immunity Issues In U.S. Cases Involving Insurance and Reinsurance," New York State Bar Association International Section, October 2015. "Solving Sovereign Immunity Issues In Reinsurance Disputes," Law 360 Insurance, October 2, 2015. "Lessons of the Recent Decisions Vacating Arbitral Awards," Reinsurance & Arbitration, October 2010. "Getting Security in Arbitration, Even From a Foreign State," The Brief (American Bar Association), Winter 2003. "Take Heart: Arbitrability Has Its Limits," Mealey’s Litigation Report: Reinsurance, October 17, 2002. "For Whom Bellefonte Tolls," Mealey’s Litigation Report: Reinsurance, May 29, 1998. "Utmost Good Faith and Rescission," Reinsurance Law & Practice, Practising Law Institute, 1997. He lives in Greenwich, Connecticut, with his wife, artist Monica Lenci. He is a leader in both professional and community affairs. He had the honor of dining with the Benchers, including the Chief Justice of Ireland, at the Honorable Society of King's Inns in Dublin in November 2017.